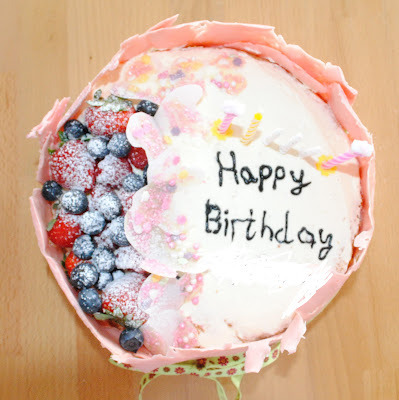 The first layer was filled with raspberry fresh cream and the second layer was filled with strawberries and cream. The pink chocolate was a bit tricky to make and the hot weather didn't help, I'll definitely have another go at this next time. We made the butterflies out of edible paper and my daughter decorated them with some edible glitter. I think she did a great job.